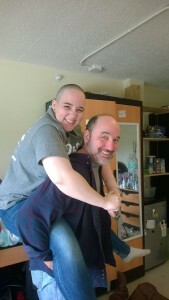 One week ago, I decided to shave my head for St. Baldrick’s day. It was something I told myself I’d never do. I could never bear to part with my hair, then I realized I actually hated my hair, and that it’s a great cause so why not. If I can help make even one person’s life a little bit better by helping to raise money to support research for childhood cancer, then it’ll be worth it. I woke up last Thursday, and I said “screw it.” If I can do this one thing to make a difference, I should do it. It’s just hair, and it’ll grow back. 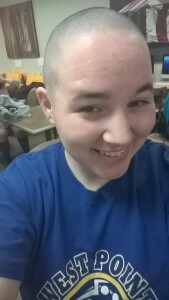 While many of the shavees had been planning months in advance and managed to raise over a thousand dollars, I started planning at 10:00 a.m., and shaved my head at 5:00 p.m. I raised $175 total, compared to some, it’s not a lot, but it’s $175 more than there was a week ago, and every dollar helps. I’ve had a shaved head for a week, and it feels absolutely amazing. I feel more confident, I find myself standing taller, and smiling more, and I feel incredible. 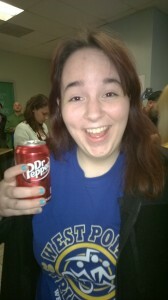 And of course, people keep asking me if they can feel my head. All. The. Time. The fact that Saint Rose participates and has the St. Baldrick’s Day fundraiser every year is just one of amazing thing about this school. This year 47 members of the Saint Rose community shaved their heads, and even those who didn’t “brave the shave” came out to clap, cheer and show support. Events like this reminded me of how amazing Saint Rose is, and how much of a supportive community we have here. While I won’t plan on shaving my head again, I can promise that I will be there next year supporting everyone else.